One of the best polish out there. Been using it on my nushoe.com shoes for quite sometime. I would rely on nushoeinspectandcorrect regarding on tips. But I do heard this one product for regular cleaning use. As with Kiwi, these are brands of shoe polish you should never use on leather shoes unless you thoroughly clean your shoes every time. Man made wax is horrible on shoes. i managed a shoe repair for 4 years and we always recommended Meltonian Shoe Creme which has lanolin and Mink Oil which preserves and protects leather shoes. 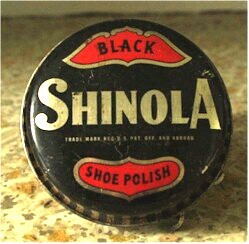 I often wondered if that saying made the Shinola people angry. Or maybe they actually liked the publicity. You must check out the Shinola entry at Wikipedia.